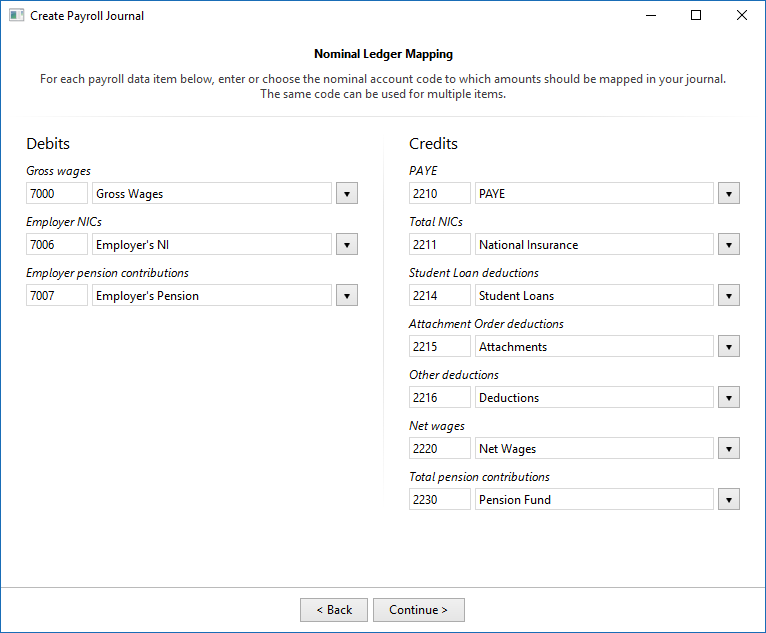 2017/18 rates, thresholds and calculations for PAYE tax, National Insurance contributions, Student Loan deductions, Statutory Sick Pay, Statutory Maternity Pay, Statutory Adoption Pay, Statutory Paternity Pay, Statutory Shared Parental Pay, Automatic Enrolment earnings thresholds and triggers, company cars, vans and fuel. The emergency tax code has changed from 1100L to 1150L. When importing from BrightPay 2016/17, L codes are uplifted by 50, while M codes are uplifted by 55 and N codes by 45. Full support for Scottish Rate of Income Tax (SRIT) codes, including the new 2017/18 Scottish higher tax rate threshold. Support for an expanded range of National Insurance Number formats. April 2017 National Minimum/Living Wage. Ability to process 2017/18 coding notices. Full support for the new 2017/18 Apprenticeship Levy, including levy calculation, allowance and reporting amounts on an EPS submission. Updated RTI submissions in line with the latest HMRC specifications. BrightPay continues to be officially HMRC Recognised for all RTI, EXB and CIS submission types. The file formats and default nominal ledger code mappings are included for Exact, Kashflow, Quickbooks, Sage and Xero. These built-in mappings can be tailored to meet your own requirements, or you can create your own nominal ledger mapping from scratch if need be. 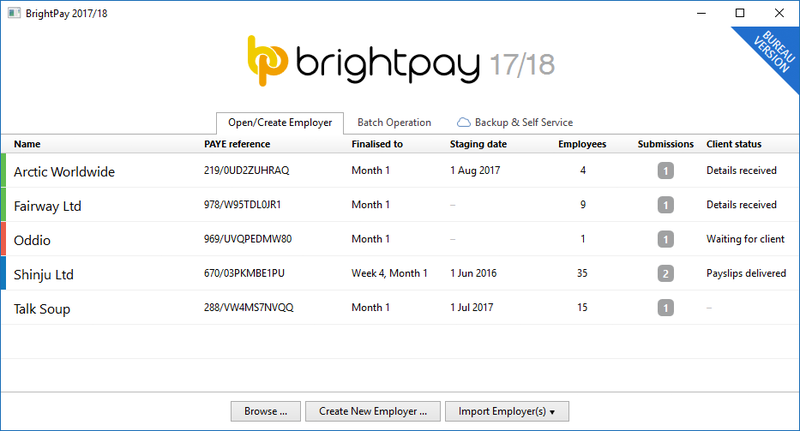 BrightPay 2017/18 includes several new features specifically targeted at accountants, bookkeepers, or other payroll bureau service providers. These bureau features are exclusive to the bureau version of BrightPay. 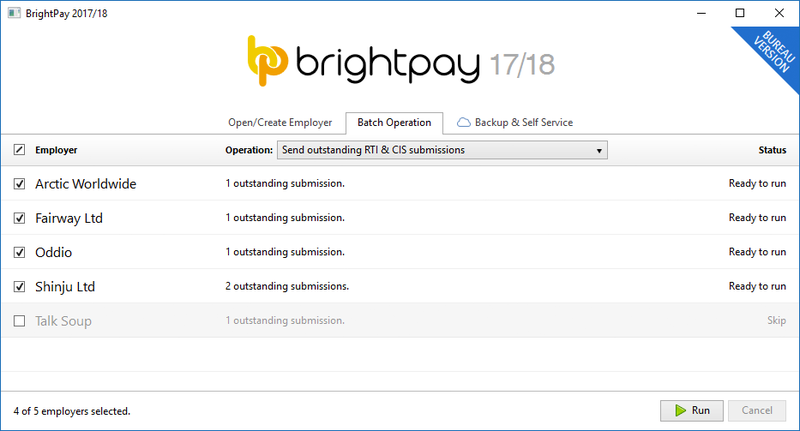 A new Batch Operation tab on the BrightPay startup window enables you to process or perform a task on multiple employer files with a single click. The first supported batch operation is to send all outstanding RTI and CIS submissions. We have plans to add more batch operations in future. In case you missed it, we launched "BrightPay Cloud" in summer 2016. We have now rebranded this as BrightPay Connect. It works exactly as it has to date, including some further refinements and new features for 2017/18. BrightPay Connect provides a secure, automated and user-friendly way to backup and restore your payroll data on your PC or Mac to and from the cloud. BrightPay Connect is built for security, reliability and stability, and costs just £49 per employer. Bulk pricing is available for bureaus. The foundational technology of BrightPay has been updated to the latest version, which immediately brings many performance, reliability and security improvements (and opens up new possibilities to our development team!). A side effect of this update, however, is that BrightPay 2017/18 cannot be run on Windows XP. We've attempted to make all customers aware of this change several times over the past six months, and our telemetry now shows that less than 1% of our customers still run on Windows XP. So while we do apologise for any inconvenience this causes, with the improvements gained it is unquestionably the best decision for our customers as whole. BrightPay 2017/18 will automatically offer to import your BrightPay 2016/17 files on first launch. New feature: Piece of Work rates – if you pay (or part pay) your employees by a unit other than salary, the hour or the day, BrightPay now caters for you. Additions and deductions can be calculated as a percentage of payslip basic, gross or net pay. BrightPay 2017/18 now allows you to adjust the 5.6 weeks statutory holiday weeks entitlement figure for annual leave calculation types. Real Time Information – more flexible workflow allows you to come back and check for a response from HMRC for an already sent submission, rather than having to start the submission process over from scratch. Company car information is now reported on the FPS submission. Vouchers and credit cards can now be payrolled. Support for new 'Serious Ill Health Lump Sum' indictor on FPS submission. Support for custom hourly/daily rate multipliers. 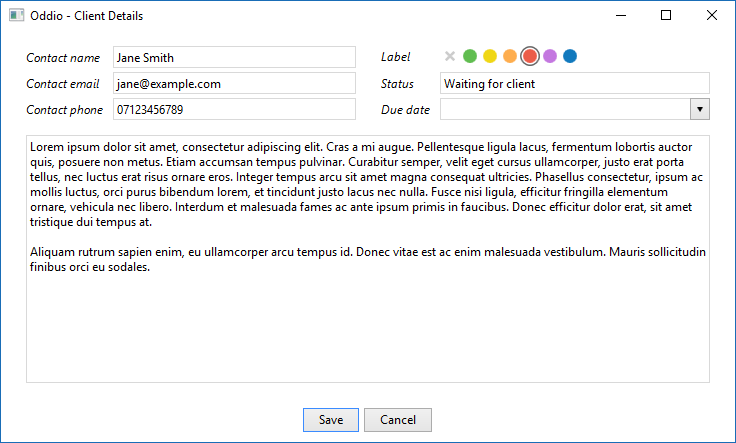 Support for starters with no starter declaration. Import from Moneysoft 2016/17 (at the time of writing, this supports importing the basic details for employers, employees and subcontractors only). Royal London contributions now use a tax monthly based contribution schedule. Statutory Minimum Wage flagging and reporting. Centralised agent sender credentials and details. Support for several new Auto Enrolment scheme providers. Ability to disable carry-over of shortfall amount between HMRC pay periods. Ability to include employer logo and further customise the layout of Auto Enrolment letters. CIS – ability to import pay records from a CSV file, zeroise payment records and print a tax period summary. Mid Year start summary report. 17.0, 17.1, 17.2, 17.X... we're continually at work on the next version of BrightPay, developing new features and making any required fixes and improvements. See our release notes to keep track of what has been changed to date at any time.